We choose each shoe for its use of current footwear design technologies and its female focused design, and its ability to be used across a variety of hiking trails. Each shoe employs a unique blend of materials in its uppers. These materials included: real leather, manufactured suede, synthetic, polyester mesh and/or a mix of these materials. All of the shoes contained in this head-to-head test offer some level of water resistance or waterproofing. 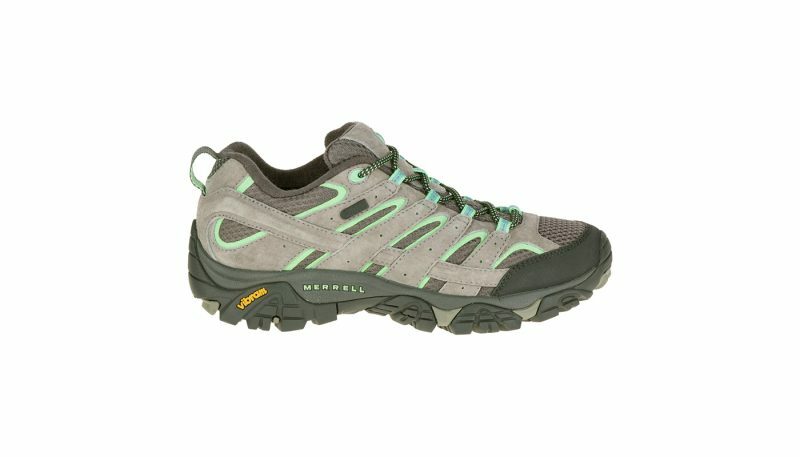 These women’s hiking shoes range in price from $120 to $185. To conduct the test, a team of avid female hikers put each shoe through rigorous exercises. Each tester hiked for a minimum of 20 miles in each shoe tested. 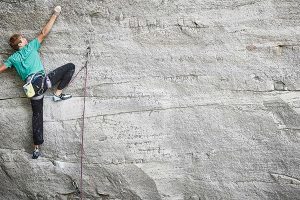 For thoroughness, they hiked over surfaces that included jagged talus and smooth boulders, loose rock and gravel and packed soil, inclines of 10 to 45 degrees and in both wet and dry conditions. Feedback on each shoe was then collected from each tester and compared, side-by-side, to determine highest overall level of performance for the category. This test was conducted in the exact same manner as the women’s hiking shoes tested last year. The trails varied slightly, but the types of terrain were repeated. All of these products share similar qualities to womens hiking shoes tested last year, with some small technical advancements including no-tie lacing systems, women’s specific lasts, and mixed rubber outsoles. 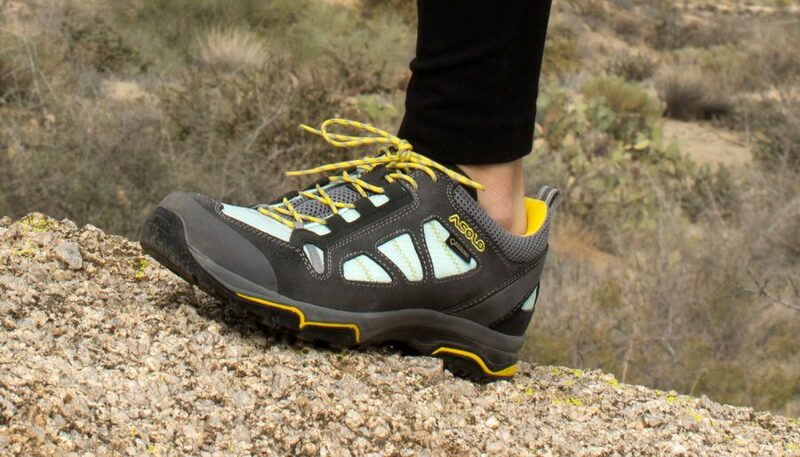 The Oboz Bridger Bdry women’s hiking shoe proved to have the highest level of protection against trail hazards of any of the shoes contained in this side-by-side test. 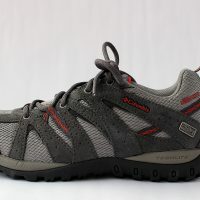 It’s thick wraparound outsole and tall technically designed directional lugs, combined with ample rubber toe and heel guards, made it the best shoe in this group for use on rugged rocky terrain. However, the Bridger’s stiffer outsole and heavier weight renders it inappropriate as a crossover shoe, for use trail running or bicycling. Merrell’s updated Moab 2 women’s hiking shoe offers a fantastic blend of out-of-the box comfort combined with enhanced stability and performance features. It’s “sticky” Vibram outsole and outsized 5 mm lugs offered the best traction of any of the shoes in this head-to-head test. A flexible sole and comfortable weight make the Moab 2 a solid choice for use in cross over sports, such as trail running and biking. 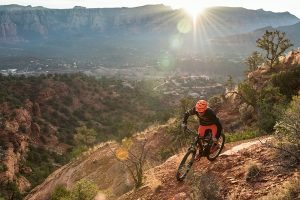 Smaller sized protective features diminish the Moab 2’s performance on long rocky trails. 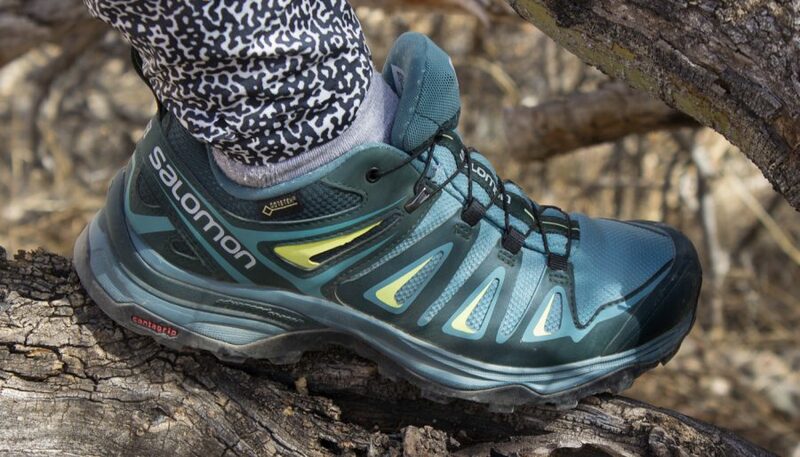 The Salomon X Ultra GTX W hiking shoes were the second lightest of the shoes tested. They provided above average support and stability, and offered a unique, quick closing, tie-less lacing system. This shoe includes a tall, well protected toe design and a reinforced sole for a very stable ride. They were a little stiffer than some of the other shoes tested, adding sole protection, but limiting their use as a crossover shoe for trail running or bicycling. THE VERDICT With the Moraine GTX Women’s, the Italian shoemaker, Scarpa, continues its tradition of creating well-crafted mountain and hiking footwear. 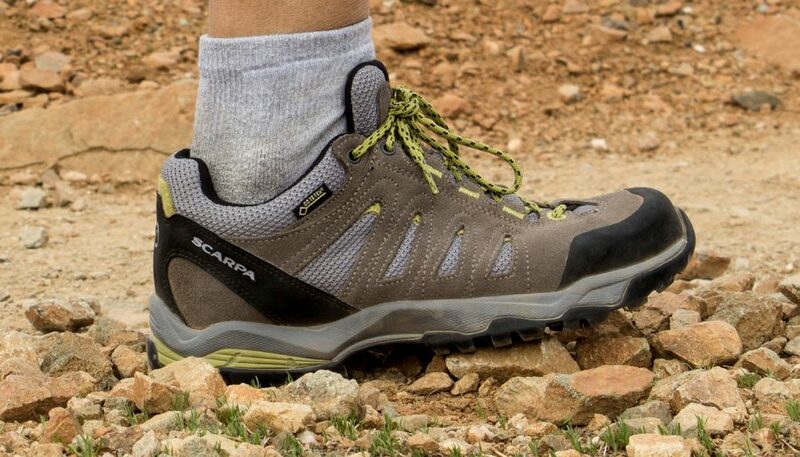 Promoted as an everyday shoe perfect for spur of the moment walking, day hiking and traveling, the Scarpa Moraine GTX Women’s is a good quality, comfortably light hiking shoe. The Moraine is designed to conform to the specific anatomical shape of women’s feet, and offers an appropriately sized toe box and instep. In our test the Moraine GTX Women’s fell in the middle for weight, comfort and protective qualities. It performed well on most trails, providing great breathability, but had some limitation in traction and side-of-foot protection during use on rocky and/or muddy trails. Although our ratings rank each women’s hiking shoe for overall quality, the best in class winner may not be the right fit your exact hiking needs. Please be sure to read through each description thoroughly to identify which shoe is best suited to your hiking style. 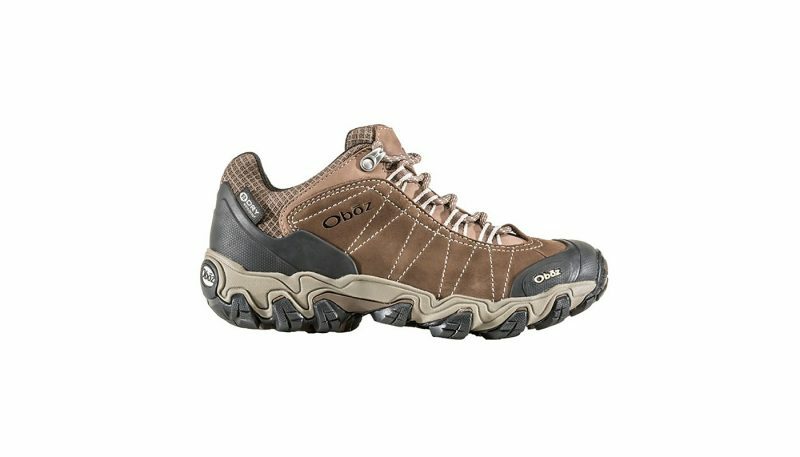 For instance, if you like steep and rocky trails the highly constructed, durable qualities of the Oboz Bridger Low BDry hiking shoe could perfectly suit your needs. While a moderate hiker seeking a super cushioning, but stable and protective hiking shoe might do better with the Merrell Moab 2. 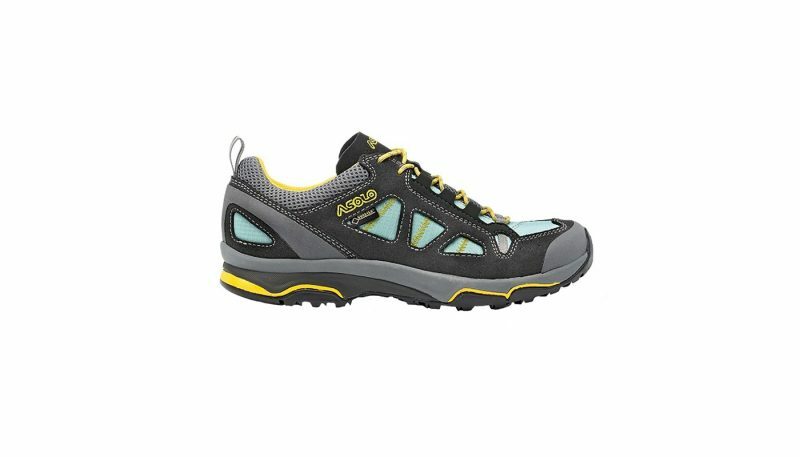 And a beginning hiker, most interested in heading out on primarily even, earthen trails could find the Asolo Megaton GV to be a prefect choice. 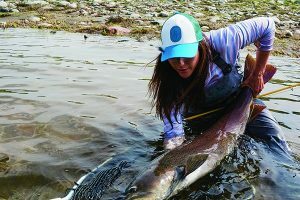 We’ve learned that each small factor in a hiking shoe’s construction plays a unique role in the type and quality of performance it provides. For example, the texture of the laces can determine how well it stays tied. And the design of, and padding around, the system that the laces run through will affect how evenly the laces hold the foot in place and whether or not you will feel that hold while out hiking. 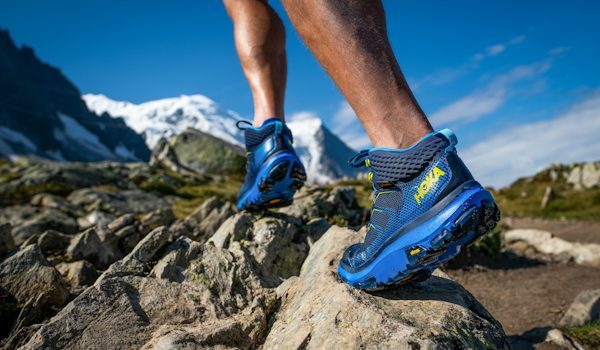 New technologies, including multiple density EVA midsoles, short nylon shanks and molded Vibram outsoles, have come a long way in providing enhanced cushioning and foot protection for avid hikers. While molded heel cups and formed insoles do due diligence to keep the foot in place to help avoid banging and blistering on steep trails. Even the depth and shape of the lugs on the base of a shoe can affect how accurately those shoes will grip the trail or whisk away debris. Although price is always a factor in selecting the right hiking shoe for your needs, it shouldn’t be the only one. Think about the trails you intend to tackle (i.e. : even or steep, rocky or earthen, frequent or occasional) and then base your hiking shoe choice on that which best addresses those needs. The best high traction performance found in this particular 2018 women’s hiking shoe head-to-head test was experienced in the Merrell Moab 2 WTPF, Oboz Bridger Low Bdry, and Salomon Ultra 3 GTX models. Each of these shoes sport technologically designed rugged outsoles, made from trail gripping materials and containing deep 4-5 millimeter lugs. Their thoughtfully designed lugs served to grab onto of all types of trail surfaces, from loose gravel or dirt, to smooth rock faces, while also whisking away mud and debris. The overall design and sticky Vibram outsoles on the Merrell Moab 2 WTPF provided the best traction of all of the women’s hiking shoes included in this test. 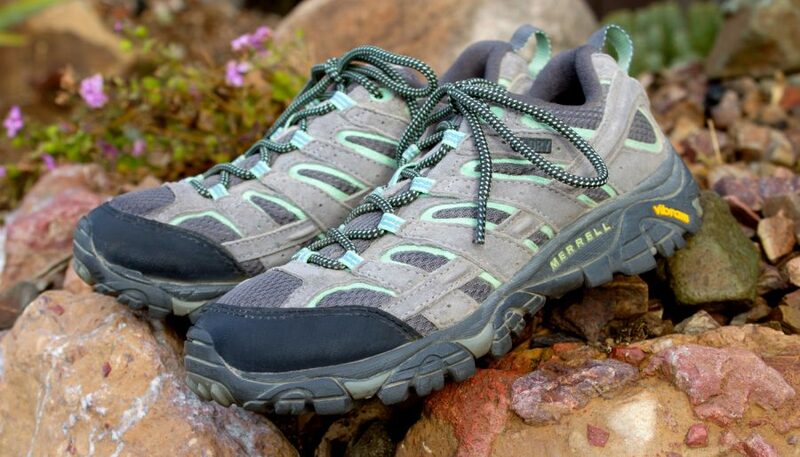 We loved the wide, wrap around designs of both the Merrell Moab 2 WTP and the Oboz Bridger Low Bdry. These extra wide outsoles provided enhanced stability and allowed for increased hold along off camber trails. Additionally, their curved heel design helped add roll and energy to each step. Heel braking ridges were another positive aspect included within these two shoes’ rounded heels. The Scarpa Moraine GTX also provided a good level of traction, but its widely spread lug and enclosed rim design limited its hold somewhat on steep trails and was prone to clogging on muddy trails. 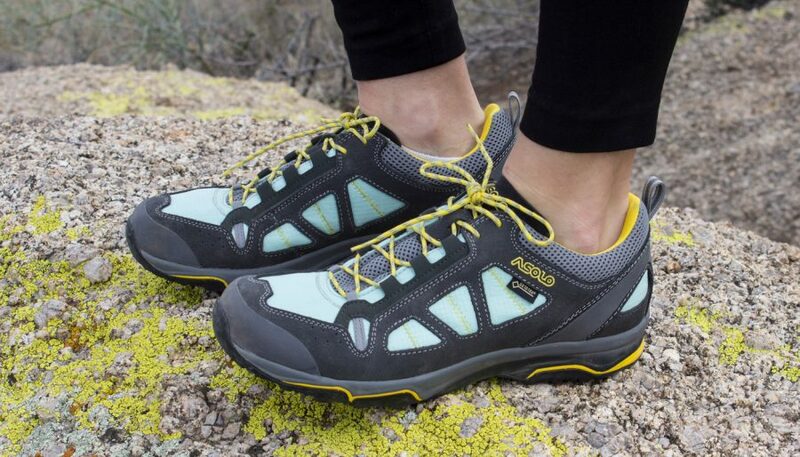 Although the sticky Vibram soles of the Asolo Megaton GVs held well to smooth surfaces, their shoe’s low-profile three millimeter lugs provided less traction, especially on steep or rugged trails. Stiffer outsoles were beneficial features in both the Oboz Bridger Low Bdry and Salomon X Ultra 3 GTX womens hiking shoes. These stiffer soles, are the result of molded EVA shanks or inserts placed between the shoe’s mid and outsoles. This small add-on enhanced these shoes overall stability by helping keep the balls of the flat from wrapping around uneven trails surfaces. On the flip side their stiffer soles, make them less viable for trail running. High cut ankle shafts offered amped ankle support in the Oboz Bridger, Scarpa Moraine and Salomon X Ultra 3 hiking shoes. The particular areas where each women’s hiking shoe in this test excelled in design, quality and construction varied for one to the next. Both Scarpa and Salomon conducted detailed research around the particular needs of a women’s foot before creating the lasts that their hiking shoes are built upon, resulting in ample toe boxes and higher cut insteps. 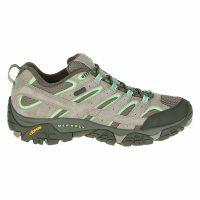 Scarpa did an excellent job of incorporating earth friendly materials into their women’s hiking shoes. 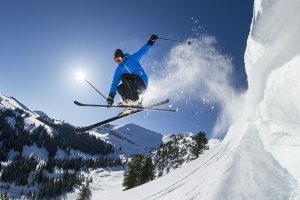 And detailed attention to customizable, firmly supporting lacing systems stood out in Oboz Bridger Bdry and Merrell Moab 2 hiking shoes, while Salomon’s no-tie system offer easy open and close technology. Thoughtfully designed, deep lugs grace the bottoms of the Merrell Moab 2, Oboz Bridger Bdry and Salomon X Ultra women’s hiking shoes. Waterproofing sealants or Gore-Tex inner membranes functioned well in each of the shoes. 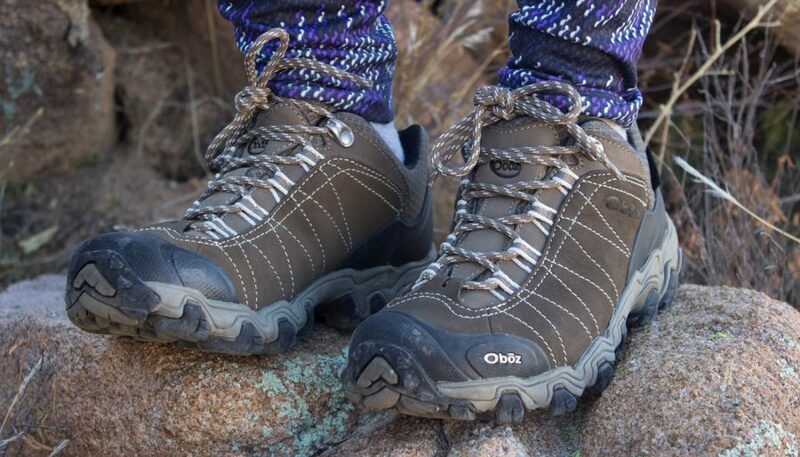 The Oboz Bridger Low Bdrys ranked highest in this particular test of women’s hiking shoes for its overarching attention to detail of design and durability of materials. In particular its generous, deeply lugged, wraparound outsoles, with breaking groves, ample toe and heel guards and durable leather uppers made it a standout for long lasting performance. 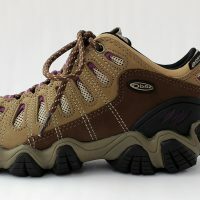 Indeed the quality and quantity of the materials used in the Oboz Bridger Low Bdry hiking shoes may make them over designed for a casual hiker, and should be considered. The extra-thick padding around the ankle shaft, cuffs and tongue on the Merrell Moab 2 WPTF made it the most ah-worthy women’s hiking shoe in this particular test. The other women’s hiking shoes tested also offered ample cushioning around the ankles and insteps. But none were quite as deep as that of the Merrell Moab 2’s. 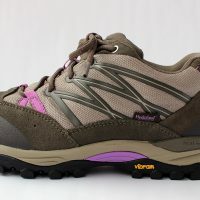 Soft suede uppers and a flexible, shock absorbing EVA midsole also added to the Merrells to top comfort rating. Where the Merrells fell a little short was in the stiffness of their outsoles. This led to some trail sensitivity during long rocky hikes. 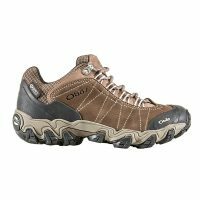 The top performance we experienced for bottom-of-the-foot comfort was in the Oboz Bridger Bdry women’s hiking shoes. 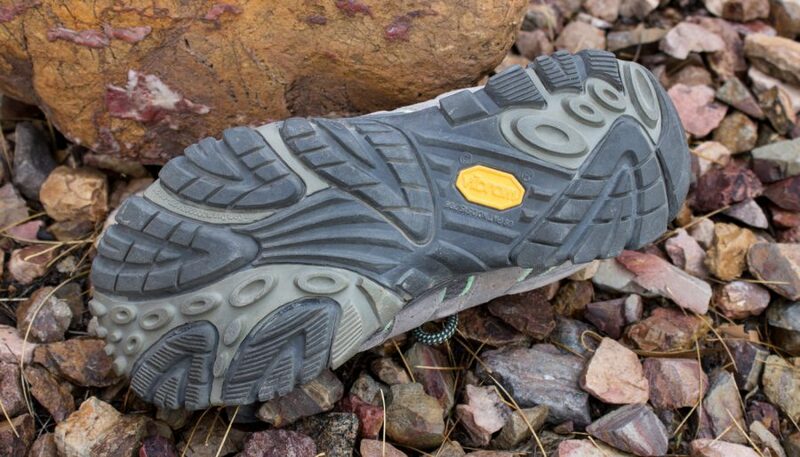 Their outsole offered the most protection, and lack of foot fatigue on strenuous hikes of the shoes tested. Ample toe boxes were prevalent in all of the shoes tested. With no issues with pinching or bruising. For breathability, the Salomon X Ultra 3 GTX, Merrell Moab 2, ad Asolos performed best—making them excellent choices for use in hot weather. A predominantly leather upper on the Oboz Bridgers made them the least breathable of the shoes tested. 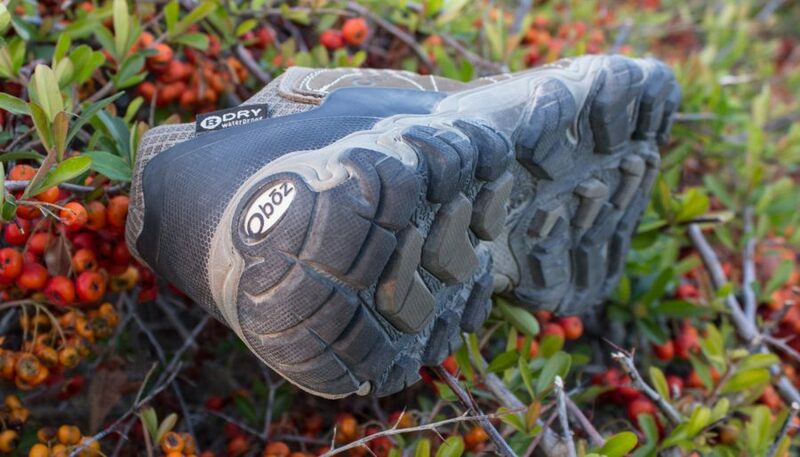 No shoe came close to matching the protective qualities found in the Oboz Bridger Low Bdry hiking shoes. From their generously wide and thick toe and heel guards, to their thick leather uppers and stiff sole—that warded off foot fatigue on rugged trails—the Oboz Bridgers made our feet feel immune to the hazards of the trail. An unusually high, protective toe bumper was built onto the Salomon X Ultra 3 GTX’s ample toe box. And solidly protective toe rands, overlaid with small, shock absorbing toe bumpers were attributes of the Merrell Moab 2, Scarpa Moraine and Asolo Megaton women’s hiking shoes. All of the shoes in this test offered highly cushioned EVA injected midsoles, which did a great job of absorbing impact and cushioning steps. The stiff sole on the Salomon X Ultra 3 GTX was another highly appreciated feature. It did a great job of protecting the soles of the feet on rugged trails, while simultaneously providing a more responsive, energetic ride than that of the Oboz Bridgers. Weighing in at only 11.3 ounces per shoe (womens size 6.5), the Asolo Megatons were the lightest hiking shoes in this head-to-head test. Their light weight makes them an ideal shoe for throwing into a suitcase for travellers. 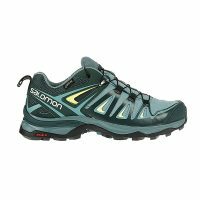 At 11.5 ounces per shoe (womens size 6.5), the Salomon X Ultra 3 GTX were a close second. 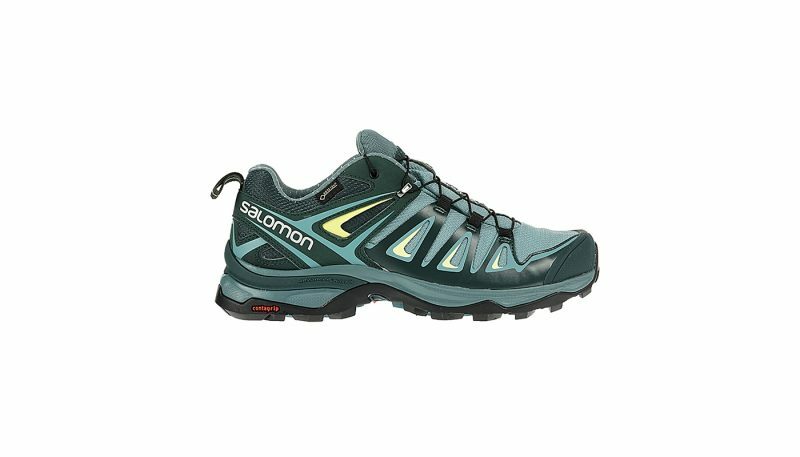 At only 0.2 ounces more than the Asolo Megatons, the protective and performance qualities of the Salomon Ultra 3 hiking shoes was a pleasant surprize. 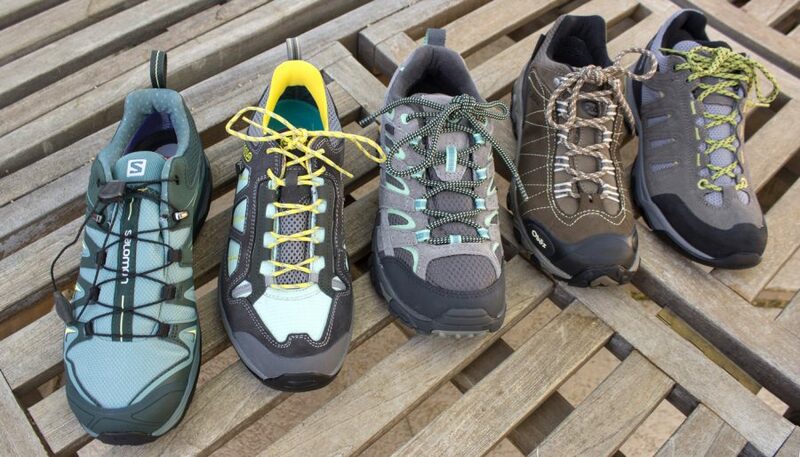 Both the Scarpa Moraines and the Merrells fell in the middle weight ranges of the shoes tested. While the Oboz Bridger Bdrys were the heavy weights at 14 ounces per shoe (womens size 6.5). 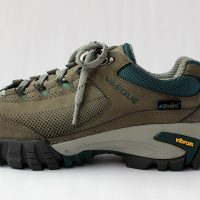 These women’s hiking shoe weights should be considered against some of the other protective and performance attribute when considering which hiking shoe is right for your particular hiking needs. Slipping and falling is simply not an option when hiking. It is essential that the outsole of a hiking shoe adequately “grip” the surface of the trail under varied conditions. Trail surfaces can be flat or steep, wet or dry, and can have surface textures ranging from smooth and earthen, to loose sand or gravel, or rough or slick rock. A quality boot needs to grip the trail in every one of these conditions. Technical factors that affect traction include the material that the outsole is constructed from (with Vibram, a slightly sticky plastic, being one of the most highly regarded at this time) and the depth and design of the lugs (or small protrusions on the base of the outsole). The lugs serve to sink into softer surfaces to provide traction, grab onto rough surfaces to provide hold and also to move water, mud and debris from the base of the shoe. 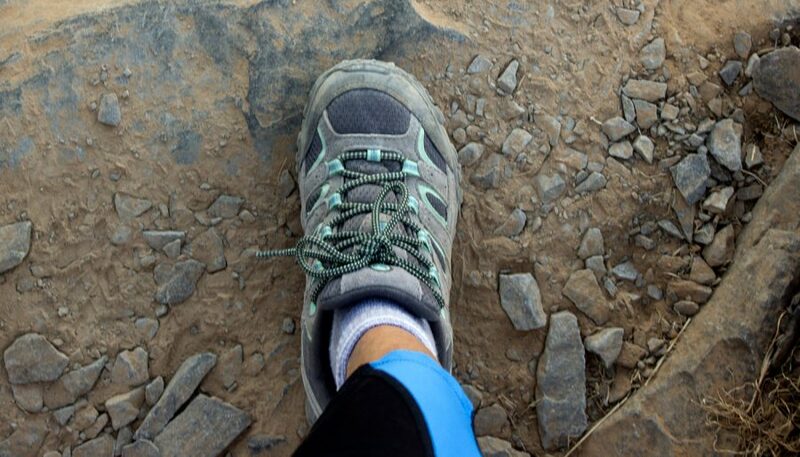 Feet can become achy, or experience trail fatigue, if they are not protected from the uneven and often jagged surfaces that exist on most hiking trails. To protect the soles of the feet, quality hiking shoes are built with a sturdy midsole, of varying densities (thicker in the middle, and thinner on the ends so as to allow flexibility where the foot bends). This midsole keeps the sole of the foot relatively flat and deters it from conforming to, or wrapping around, each rock or root on the trail—which can lead to base of foot bruising and fatigue. In some hiking shoes a short, stiff shank is also added to the center of the midsole for added protection. Beyond the stiff midsoles and thick outsoles that help protect and cushion the soles of the feet, a good hiking shoe needs to also protect the foot from toe, heel and side impacts. It is almost inevitable that at some point your toes will come into contact with a boulder that you didn’t quite lift your foot high enough to step over. This is a big ouch, and potential end-of-fun-day-hiking, if your shoe doesn’t provide the protection required. The best toe and heel guards are constructed of thick rubber overlays, which cover most of the toe and heel areas. Rubber serves to bounce the foot away from impact points and also to diffuse the blow. Another common hiking shoe toe and foot guard construction is made by adding a second layer of leather to the tips of the shoes. The leather functions similarly to rubber, but with a bit less shock absorption. The sides of the feet can also be vulnerable to rocks and uneven trail surfaces, if not adequately reinforced. As feet move along uneven trails they often tilt from side-to-side, bringing them into contact with loose rock or talus. Uppers with reinforced lower sides, of rubber or leather, function to protect the sides of the feet in these circumstances. The supporting attributes of a hiking shoe serve to keep the ankles from twisting, and arches from collapsing, while hiking the trails. Padded ankle cuffs, and stiff molded heel cups are some of the most effective ways to support the ankle—a combination of the two being ideal. Molded insoles of newer plastics such as EVA are often stiffer in the center, providing extra arch support while still allowing flexibility where the foot bends. These insoles can typically be interchanged with third party insoles or an orthotic if needed. 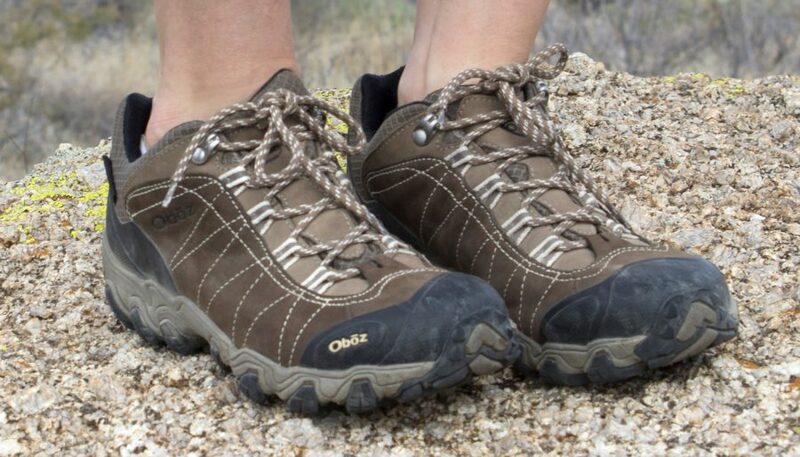 Hiking shoes should be stiff enough to retain their shape around the ankle during repeated use. Hiking shoe comfort is dependent on fit and padding, as well as the majority of the protective and supportive properties mentioned earlier. Since every person’s foot is shaped differently, the cut of one shoe may work well for one individual but not another. Considerations such as toe box width, and lacing system flexibility will be influential in determining which hiking shoe fits you best. Padding, however, is universal to a comfortable shoe. Thick cushioning around the ankle cuffs (to avoid chafing) and below the tongue (to keep laces from digging in) are key points to increase comfort. Further advancements in energy returning materials will continue to add bounce and cushion to the inner and midsoles of quality hiking shoes. How well a hiking shoe lasts is dependent on the quality of both its materials and construction. All parts of a hiking shoe should be able to stand up to repeated scuffs and scrapes. Uppers should have enough heft to not buckle and loose shape where they continually flex around ankles and bend above toes. Outsoles should resist compacting too quickly as the miles accumulate. And sturdy seams, thick durable textured laces, and well-wrought attachments between the various components should hold up to strenuous use. Better quality materials and construction do tend to cost a bit more, but may not be needed for an occasional, or casual, day hiker. In the lightweight hiking shoe category the weight of the shoe will play a role in determining its overall performance rating. The density of the construction materials used typically affects weight. 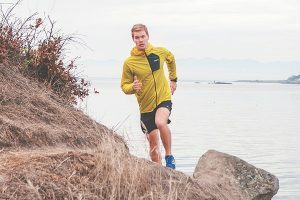 Newer technologies continue to provide the strength required, for a shoe to withstand the rigors of the trail, to less dense and weighty materials. When appropriate to the category level of waterproofing will also be rated. Waterproofing includes both the shoe’s ability to repel moisture in wet circumstances as well it’s ability to resist leaking when submerged repeatedly, to just below the ankle cuff, in puddles of water. Another consideration in the waterproofing rating is breathability. A waterproof shoe often means poor breathability but materials like mesh panels and a waterproof/breathable membranes work to find a balance. 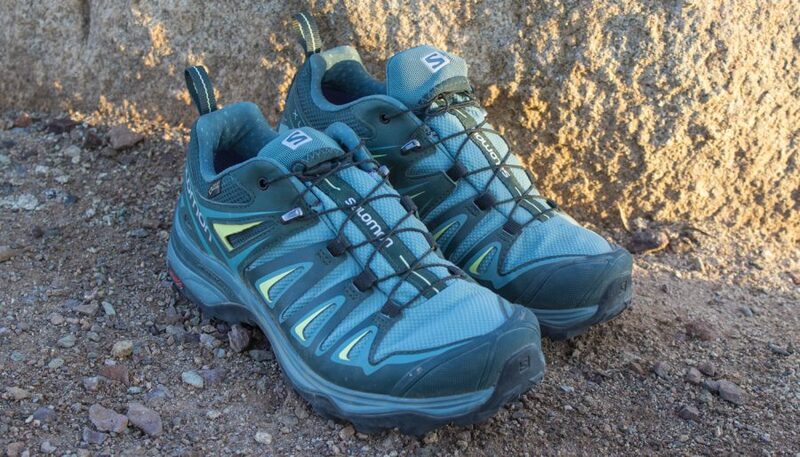 A good hiking shoe needs to retain its breathability to wick away sweat, and to keep feet dry and blister free. 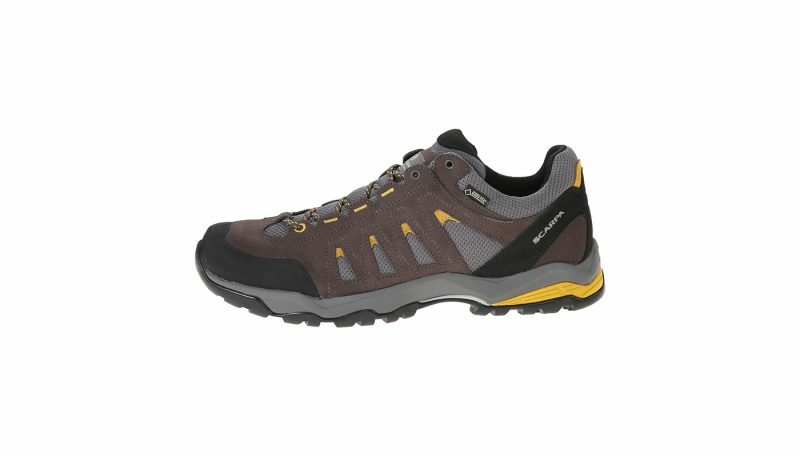 What Are Women’s Hiking Shoes? 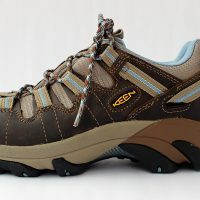 Hiking shoes, versus boots, are defined by an ankle shaft height that stops just below the ankle. As a result of their reduced height, hiking shoes are typically lighter than boots, and are preferred by many hikers for this reason. A tradeoff with the shorter ankle shaft is reduced ankle support. Resultantly, hiking shoes may not be the best option for hikers with less stable ankles that are prone to twisting. 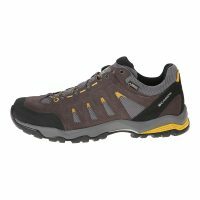 There are vast differences in the type of shoes that fall under the Hiking Shoes category. Hiking shoes can range from rugged, deeply lugged and reinforced shoes, to super lightweight, minimalist shoes—which are more akin to a running shoe with a beefed up tread. Newer materials such as Vibram, EVA plastics, nylons and treated mesh have allowed both hiking shoes and boots to evolve drastically in their level of comfort, protection and performance from the heavy, leather and steel toed, hiking boots of the 1950’s and 60’s. And wonderfully, these technologies continue to refine to provide better energy return, lighter weight and other important product aspects. 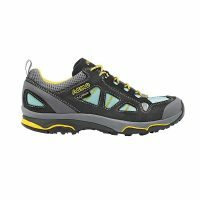 Women’s hiking shoes are specifically engineered to fit to a women’s foot size and physicality. They may include enhanced padding and or arch support. The price of women’s hiking shoes also varies greatly. 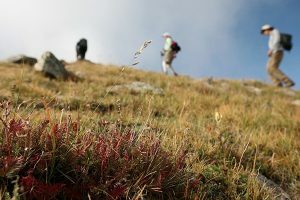 It is recommended that price play a lesser role in choosing the right hiking shoe than aligning the qualities of a particular shoe with your particular hiking style and needs.